Rendering of the Beach 21st Street development in Far Rockaway. Queens, NY Less than one year since the Downtown Far Rockaway rezoning was approved, the New York City Economic Development Corporation (NYCEDC), Department of Housing Preservation and Development (HPD), Housing Development Corporation (HDC), and council member Donovan Richards unveiled plans to deliver over 670 units of affordable housing across two projects located in the neighborhood’s core. The city selected The Community Builders, Inc. (TCB), a nonprofit developer of affordable and mixed-income housing, to activate an underutilized city-owned lot at Beach 21st St. to create 224 units of mixed-income affordable housing, commercial space, and community facilities. HPD and HDC have also recently closed on construction financing to deliver 457 units of affordable housing for the initial phase of the Far Rockaway Village project, which will transform the neighborhood’s long-neglected shopping center into a mix of affordable housing, retail, and public space, serving as a village center for the neighborhood. Just 10 months since the city council’s approval of the neighborhood’s rezoning, these projects demonstrate major progress in downtown Far Rockaway. The city committed to reestablishing the area as a dynamic mixed-use neighborhood and the commercial hub of the peninsula as part of the Roadmap for Action, a 25-point interagency plan for neighborhood-wide investment. The Roadmap for Action was developed in response to recommendations from the Downtown Far Rockaway Working Group and served as the framework for the neighborhood’s rezoning. “We’re making good on our promise to Downtown Far Rockaway. The City is delivering unprecedented investment that will improve the lives of residents and bring new vibrancy and opportunity to the neighborhood,” said NYCEDC president and CEO James Patchett. “We are thrilled to see a large affordable housing development take shape so soon after the community-driven Downtown Far Rockaway Plan was adopted. Just as important is the mixed-use nature of this first project, which includes a large, accessible public plaza – with public art, seating and planted areas to manage storm water – flanked by retail and commercial space. We’re off to a running start. Kudos to the Downtown Far Rockaway community for a truly excellent example of neighborhood planning,” said Department of City Planning Director Marisa Lago. ?The City’s selection of TCB will transform a City-owned lot into a new mixed-use, mixed-income development with over 130 units allocated for households earning up to 60% of area median income. The remaining units will be offered at a range of affordability levels. The project will also create approximately 24,000 square feet of ground-floor retail space, 8,000 square feet of community space for early childhood education and other community services, and approximately 90 parking spots for residents of the building and the public. Adjacent to a planned DOT pedestrian plaza and across the street from the new Beach 20th Street plaza, the project will deliver new retail and housing options in a central site in the neighborhood, encouraging new investment throughout the rezoning area. The project is expected to create over 70 permanent jobs and over 470 construction jobs. The Community Builders Inc. has committed to 40% M/W/DBE participation, and participation in the City’s HireNYC initiative. The project is expected to break ground in 2019, with completion in 2021. Developed by Phipps Houses, the initial phase of Far Rockaway Village will replace a largely abandoned shopping center with new mixed-income housing, centralized public space, and enhanced retail that better serves the community. 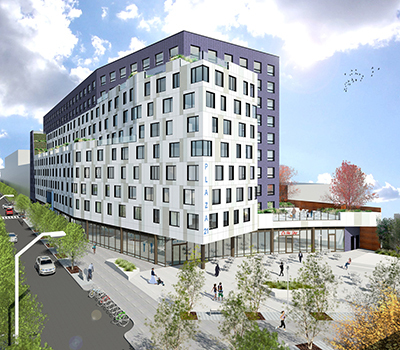 HPD and HDC have provided construction financing to create 457 units of affordable housing in the first phase of the Far Rockaway Village development. This project will include 67 units for extremely low-income households—46 of which will be designated for formerly homeless households; the remaining 388 units will serve a diverse range of household incomes including very low-, low-, and moderate-income individuals and families. The first phase of the project will also deliver 92,000 square feet of commercial space and 23,000 square feet of public plaza space to the heart of the neighborhood. Construction of the first phase of the project is expected to be complete by late 2021. “As the Rockaway renaissance continues, revitalization of the downtown area will be a tremendous step forward to realizing a better downtown—a better Rockaway,” said Assemblywoman Michele Titus. “We are thrilled to be one of the first developers to put shovels in the ground in pursuit of the goals for the Roadmap for Action,” said Jesse Batus, Senior Project Manager, The Community Builders. “We are excited about the announcement of The Community Builders, Inc. as the selected developer of the Beach 21st Street development site. The announcement further demonstrates this administration’s commitment to revitalizing neighborhoods such as Far Rockaway that remained largely ignored for decades. We look forward to working with The Community Builders to insure that local residents, businesses, entrepreneurs and organizations play an active role in this transformative development project,” said Kevin Alexander, President & CEO of Rockaway Development & Revitalization Corporation. In September 2017, the City Council approved the de Blasio Administration’s plan to rezone Downtown Far Rockaway, which helped to bring $288 million of investment to the area. Building a new open space on the site of a vacant DSNY site at Brunswick and Nameoke. Advancing comprehensive renovation of the Downtown Far Rockaway Library. Upgrading sewer infrastructure, expanding sidewalks, and creating new public plazas, including the new plaza adjacent to this site on Beach 21st Street. Providing free legal services for Rockaway residents facing unlawful evictions and tenant harassment. Supporting existing businesses through free legal services and increasing access to other small business resources. Sourcing grants for cultural organizations and increased arts programming. Installing real-time bus arrival displays at key bus stops. The Downtown Far Rockaway Roadmap for Action was developed based on the vision of the Downtown Far Rockaway Working Group — a team of local stakeholders convened by Council Member Donovan Richards in 2015 — to develop a set of goals and recommendations to support the revitalization of the neighborhood. The Downtown Far Rockaway Working Group received input from hundreds of community members and delivered their recommendations to Mayor de Blasio in February 2016, asking that the City activate long-vacant sites, increase access to housing and retail opportunities in the neighborhood, and help the area realize its potential as the commercial hub of the peninsula.